Poseidon announced at the 2018 DEMA Show that it will phase out its pre-packed scrubber cartridge for the MKVI Discovery and SE7EN rebreathers. A Type-R rebreather is a simple-to-operate rebreather. Poseidon therefore worked with Molecular Products to develop a pre-packed pre-assembled Carbon Dioxide (CO2) scrubber cartridge to remove the task of the diver packing the scrubber. The diver simply unwrapped the pre-packed scrubber and slid it into the unit. At the end of a days diving, they removed the scrubber cartridge and threw the whole thing away. When it comes self-packing a scrubber, there are a number of considerations that a diver must take into account. These include checking the expiry date of the sorb (and this also applies to pre-packed canisters as well) and not over / under filling and not over / under tamping the scrubber. A too tightly packed scrubber can make the work of breathing a harder effort, and it is possible for gas channelling to occur in an under tamped scrubber. 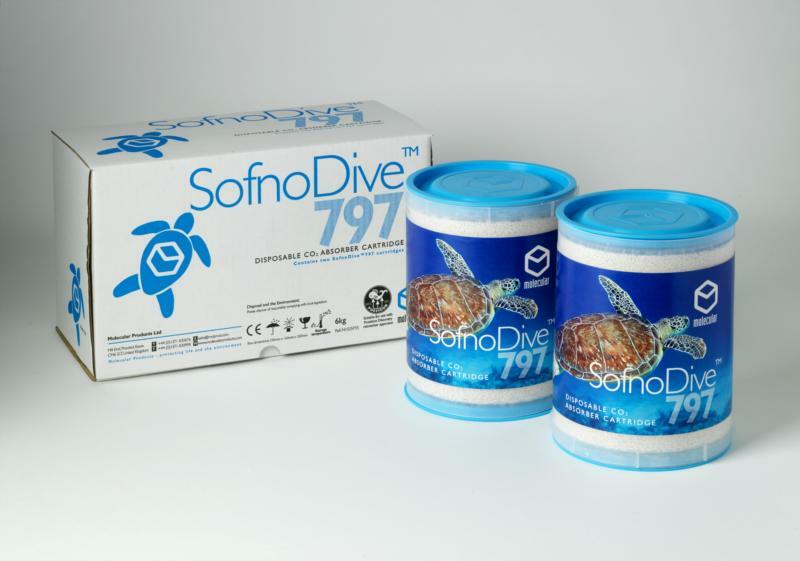 The idea behind the pre-packed SofoDive 797 canister was that it removed these potential errors for new rebreather divers, and the canister would deliver a more consistent performance. It would be fair to say that seasoned rebreather divers were not that keen on the pre-packed scrubber canister. Poseidon stated that their single-use canister could only be used once opened, within 12 hours, and needed to be thrown away once diving had ceased, not matter what diving you had (not) done. Whilst I am not advocating that anyone should push a scrubber, to bin a scrubber where you had done a 30 minute dive, and you were planning on diving the next day, seemed daft, especially where you were tracking your scrubber usage. The pre-packed canisters were more expensive than buying loose Sofnolime 797, and there was the environmental issue. The one-time-use canisters were made from plastic, and there was no mechanism to recycle / return them. Finally, not every rebreather centre stocked the Poseidon canisters. The solution for many Poseidon divers was to buy a refillable scrubber canister from a third-party manufacturer. Now Poseidon has announced that they have taken the decision, together with Molecular Products, to phase out the one-time-use canister in favour of a repackable scrubber. This move will certainly be warmly greeted by the dive professionals and divers alike. Poseidon has advised that they will be providing information and videos on how to pack ther new scrubber soon. This may well be an invaluable resource in the future because their marketing is pretty slick. We do know that the new scrubber canister has been through third-party testing and was conducted to the CE standard covering rebreathers: EN14143. We believe that the new 'pack-your-own' scrubber will have an approximate 2 hour duration, compared to the current 3 hour duration on the pre-packed canisters. Poseidon will have sufficient pre-pack canisters in stock to cover demand in January / February. It is thought that the new canister will be coming on line in February / March 2019. Despite marketing claims, the Poseidon MKVI Discovery wasn't the world's first recreational rebreather. That honour was given to the semi-closed Drager Atlantis (later renamed the Dolphin) rebreather in 1995 / 1996.